Movie review of “Brooklyn”: A young Irish woman, who matures throughout the movie, moves to the U.S. and meets an Italian-American suitor. Saoirse Ronan stars. Rating: 4 stars out of 4. The Lacey women, wrote Irish novelist Colm Toibin in his 2009 book “Brooklyn,” could do everything, “except say out loud what it was they were thinking.” In John Crowley’s lovely film made from the novel, Saoirse Ronan (“Atonement”) provides a master class in showing, not saying, what her character Eilis Lacey is thinking. The movie unfolds on her quiet face; it’s as if we can see each emotion before it fully arrives, like a wave gathering momentum on an otherwise still tide. The story is a simple one: It’s the early 1950s and Eilis, the obedient younger daughter of a widowed, weary mother (Jane Brennan), leaves her small Irish town for a new life in America. It wasn’t her idea — her more vivid sister Rose (Fiona Glascott) has arranged it, and Eilis doesn’t really want to go, but, characteristically, doesn’t say so. Installed in a boardinghouse in Brooklyn, Eilis initially seems to be wearing her homesickness like a heavy coat, dwarfing her. But soon she meets Tony (Emory Cohen), a sweet Italian-American suitor, and begins to settle in — until unexpected news from across the sea threatens to uproot her new stability. Ronan, in every scene of the film, creates a reserved young woman who seems to mature before our eyes, quietly revealing Eilis’ open, yearning heart. Adapted by Nick Hornby with both warmth and wit (particularly every scene involving Julie Walters’ loquacious landlady, Mrs. Kehoe), the film just might leave you, as it did me, blinking away a happy tear. 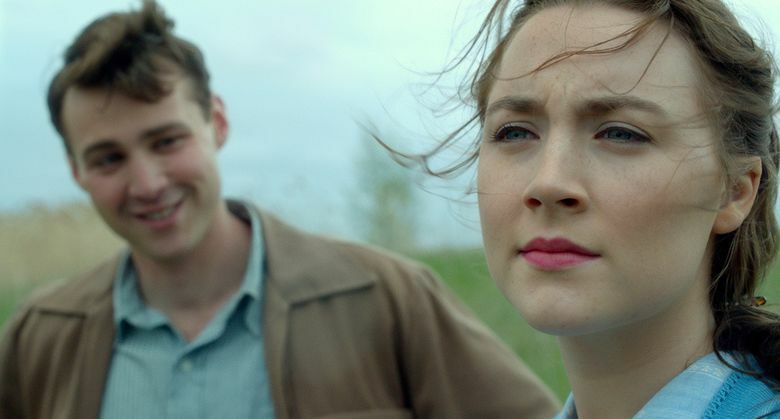 “Brooklyn” is, ultimately, a gentle reflection on how we create home, wherever we might be. ‘Brooklyn,’ with Saoirse Ronan, Domhnall Gleeson, Emory Cohen, Jim Broadbent, Julie Walters. Directed by John Crowley, from a screenplay by Nick Hornby, based on the novel by Colm Toibin. 113 minutes. Rated PG-13 for a scene of sexuality and brief strong language. Several theaters.